What is the best entry-level, starter or budget tripod? I have been long-recommending the Manfrotto 190 series tripods for those looking for a quality tripod that does not require a big budget. 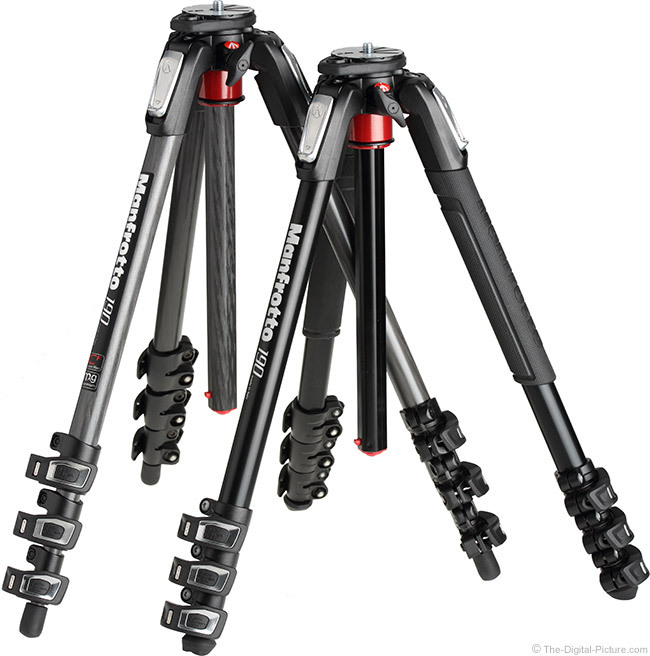 The Manfrotto brand name is synonymous with good value and the 190 series tripods offer a very healthy dose of value. Just prior to attending the 2013 PhotoPlus Expo, I ordered a 190 series tripod in both aluminum (190XPROB) and carbon fiber (190CX) with intention of getting reviews of both onto the site. While walking the PPE show a couple of days later, I discovered brand new 190 series tripods models on display – the MT190 series. After side-by-side comparing of the new models to the old, I cancelled plans for reviewing the models I already had in my possession. The new models had very innovative advances and more height. The enhancements were worthy of the upgrade in my opinion. As of review time, there are many tripods (and tripod-with-head kits) in the Manfrotto 190 Series with a range of prices, but the 4-leg-section Manfrotto MT190XPRO4 Tripod along with its 3-leg section and carbon fiber counterparts have the latest and greatest features. Three-leg-section tripod models typically have a stronger/thicker bottom leg section, are slightly faster to deploy and are often slightly less expensive. The 4-section models fold to a more-compact size and will go lower to the ground without spreading the legs beyond the first angle lock. 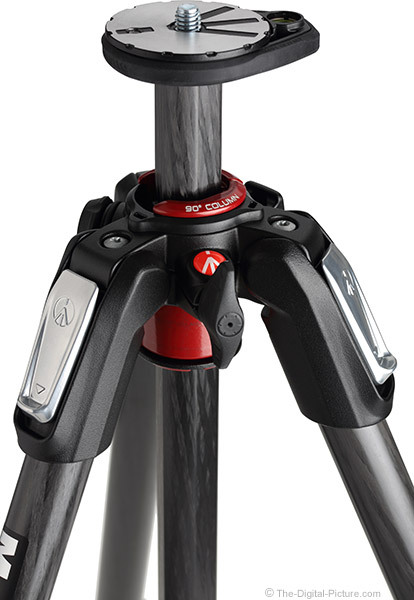 As illustrated above, the Manfrotto 190 series tripods are available in anodized aluminum alloy or carbon fiber. I will leave discussion of the advantages and disadvantages of carbon fiber to the Manfrotto MT190CXPRO4 Carbon Fiber Tripod review, but looking at the weight spec in the table below will give you a big hint. Note that some of the product images shown in this review are of the carbon fiber model, but the features being shown are identical. The folded length difference between the aluminum and carbon fiber models is visible in the comparison picture below. On an extended tripod (center column retracted) and a medium-sized ball head installed, the viewfinder on a non-pro/non-gripped DSLR camera viewfinder reaches to mid chin on me (6'/1.8m tall). I can bend forward slightly, spread my own legs slightly and use this tripod in standing position without difficulty. Raise the center column to its max 9.8" (25cm) height and I need to stand on something to see through the viewfinder unless shooting straight upward. The high quality Ducati-inspired (seriously) high-grip rubber leg warmers on two of the legs make the aluminum model comfortable to hold in temperature extremes and provide a sure grip in inclement weather. 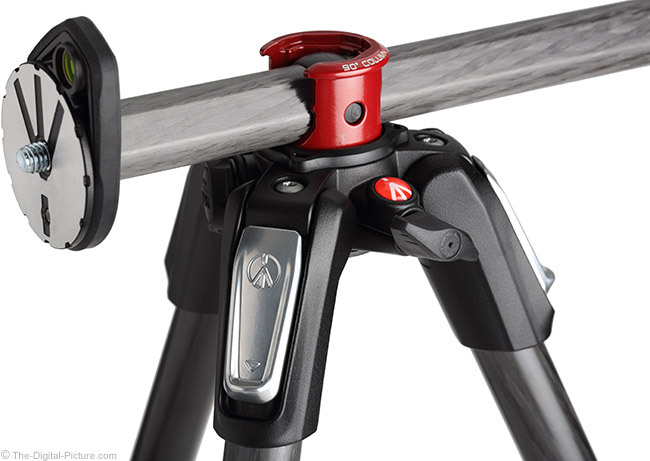 The Manfrotto MT190XPRO4 Tripod's friction-lock rapid center column is not reversible or removable, but with the press of a red button on the bottom of the column while lifting, the red center column collar (see above) releases up from the column and allows the column to pivot to a 90° orientation as shown below. The center column friction control then controls the ability of the center column rotation and extension (center column rotation is not permitted in vertical orientation). This is a very innovative tool-less design that is very easy to use as well as being very useful. Being able to direct the camera straight down is great for macro photography and for copy work. In the 90° horizontal orientation, this tripod goes right down to ground level without having to remove the center column. Important: In the 90° orientation, care must be exercised to prevent your rig from becoming unbalanced and tipping over. A plastic hook for adding counterweight is provided on the side of the spider; though this counterweight is nearly centered on the tripod (requires more weight to offset extended weight). The most significant downside to using a center column (on nearly all tripods) is that vibrations are noticeably increased. As this center column is extended the vibrations become more noticeable. I suggest reducing my maximum focal length suggestion (below) by about 100mm at full extension. Though you will not see it after your tripod head is installed, the top plate is aluminum, which allows for very solid mounting surface for the tripod head. Just below the top plate is a bubble level that rotates to the desired/visible position. The level should be considered for close approximation only as the reading fluctuates slightly as it is rotated around the top plate (especially on the carbon fiber model). With the center column retracted, the rubber-like coating around the level becomes compressed at two or three positions on the chassis/spider, potentially reducing solidness of the setup. I can't confirm that any real difference is realized by this small issue. Tripods generally use a small metal slider to set the angle their legs will locks at. This design works fine, but requires a multi-step approach to the setup. 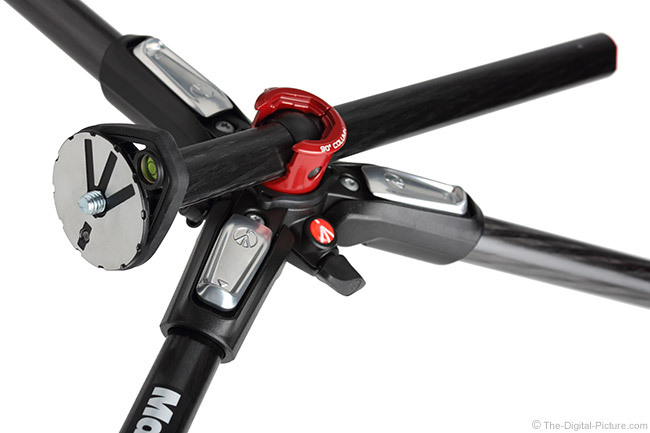 The MT190 tripods break the standard by using a spring-loaded lever that, when pulled down, allows the legs to be quickly and simply locked into one of 4 leg angle positions with one motion. These angle lock levers will not release when locked in position. The tripod leg must be pulled downward/inward slightly to enable the angle lock lever to be released. Leg angle positions will automatically ratchet-lock into any position when pulled downward/inward (no lever pull required). A benefit of this design is that it avoids pinched fingers. I generally use the more-compact twist-lock style leg locks, but the Manfrotto QPLs, with a short-throw and lever action, are a very nice upgrade to flip locks I've previously used. When the legs are fully retracted, all locks on a leg can be opened or closed simultaneously. Locking and unlocking the QPL leg locks can be done very quietly, but they will make a very audible snap if you are not dampening the action with your hand. Wildlife photographers and those shooting quiet venues should take note of that data point. The leg locks are quite strong, holding roughly 150 lbs. (68kg). When using a tripod and especially when working with close subjects, accessories are often needed for the ideal photograph. And an extra hand is often needed to hold those accessories. To provide that extra hand, Manfrotto includes a 3/8" threaded port that accommodates a huge range of photographic accessories and an even broader range of accessories that can be attached to those primary-attached accessories. Attach reflectors, diffusers, flags (to block light - not support your country or favorite team), LED lights, flashes, clamps, articulated or flexible arms and anything else your imagination can dream up. Simply remove the contained rubber Easy Link Plug port cover and thread your accessory into the port. The image below shows a Manfrotto Magic Arm attached. When attaching an accessory to this port, care must be taken to keep the overall setup balanced. Again, a hook is provided for adding counterweight. A primary reason you buy a tripod is to hold your camera steady. As a rough generalization, the heavier the construction of tripod is and the more expensive it is, the more rigid and strong it will be. Of course, heavier and more expensive are generally both undesired attributes for a general purpose tripod, so a balance must be established. The rigidity/strength balance established by the Manfrotto MT190XPRO4 Tripod is such that, when retracted, a 300 f/4 lens is about the maximum I would want to have mounted. Use of a 300mm f/2.8 lens may result in varied image quality due to the vibrations noticeable with such in use. The 300mm f/4 lens is going to be too much for reliable use on this tripod fully extended with the center column retracted in most circumstances. Plan on a 200mm lens being satisfactory in this state. Any wind blowing will complicate these rough guidelines and larger/longer lenses will show continuous vibration in the viewfinder in such situations. I highly recommend that you do not buy a cheap, low quality tripod. If not turned off completely from tripod use, you will probably be buying a second tripod after learning this lesson. The Manfrotto 190 series is a very good entry-level choice. 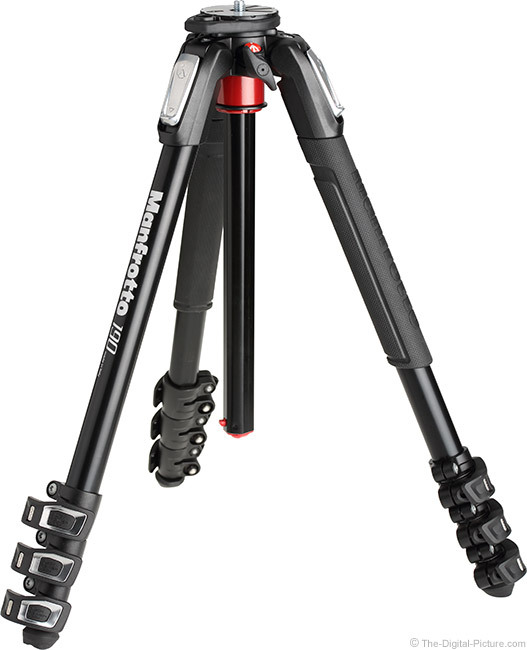 There are currently significantly less expensive non-"MT" Manfrotto 190 Series tripods available and these work very well, but the MT series models will give you the latest and greatest features. You need to determine what your budget allows and your needs require. 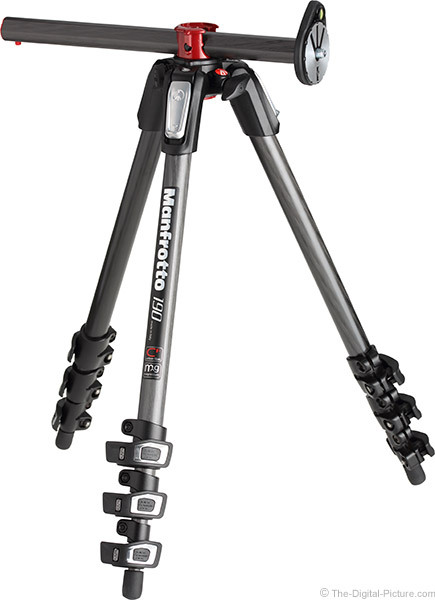 The Manfrotto MT190XPRO4 Tripod is great looking product with a far-above-average amount of design innovation implemented. 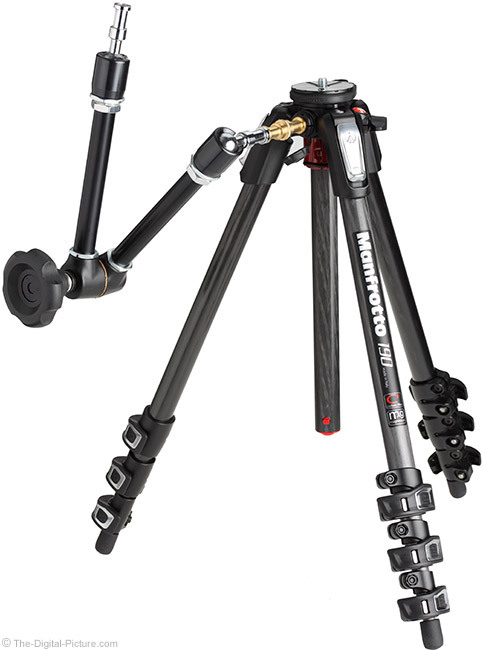 Manfrotto's Quick Power Lock (QPL) leg locks, pull-down angle lock releases and the 90° center column design are differentiators in the crowded field of tripod options. And the feature that many will find most to their liking is that the price for the great looks, quality and design is relatively low.